California has joined a growing number of states by legalizing marijuana for recreational use. Starting in 2018, California residents will be able to purchase the drug in storefront locations without a medical marijuana license. While laws permitting non-medical marijuana use have become increasingly common, there has been little research on the effects of more widespread marijuana use, such as its effect on roadway safety. One safety group has recently released research detailing possible effects of marijuana intoxication on the safety of roads in states that have legalized recreational marijuana use. As with the effects of many other illegal substances, there has been little research on the effect of marijuana on a user’s ability to drive safely. Unlike alcohol, blood levels of THC (the active chemical in marijuana) are difficult to measure at a roadside stop, making it a challenge for police to know whether a driver is driving erratically due to marijuana intoxication or for some other reason. 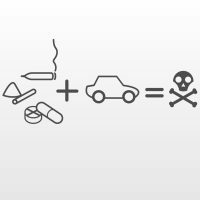 Additionally, THC has varying effects on users, making it difficult to establish a maximum amount of the drug that users can consume before they should consider themselves unsafe to drive. The sparse prior research on the effects of marijuana have not been conclusive as to its effects on drivers. One study found that drivers with THC in their systems were twice as likely to be involved in a car accident as those who hadn’t used drugs or alcohol. However, a federal study that looked at the safety of marijuana-using drivers found no link between marijuana use and an increased risk of being in an accident. Recent research from the Highway Loss Data Institute (HLDI) has found that states that have legalized marijuana use for recreational purposes do see an elevated risk of crashes. HLDI examined the rate of collision claims filed in three states that had legalized marijuana and compared those rates to those in neighboring states. Collision claims are typically filed by the at-fault driver themselves based on physical damage to their vehicle. The study found that these states had a 3% higher collision claim rate than states that hadn’t legalized the drug, though Colorado had a surprising 15% higher rate. It is important to remember that, even where recreational marijuana use is legal, drivers remain liable for accidents they cause while intoxicated. This study does indicate that California law enforcement should develop new methods and practices for enforcing laws related to driving while intoxicated before the drug becomes widely available here. If you’ve been the victim of an accident with an intoxicated driver in Southern California, find out if you’re entitled to money damages for your injuries by contacting the knowledgeable and effective Palmdale auto accident attorney Paul Kistler for a consultation, at 661-206-6990.